With the most complete range of Crushing and Screening Buckets in the world, MB Crusher expands its product line by including the Hydraulic Drum-Cutters MB-R. Available in 4 models, for excavators and loaders from 6,000 lb to 77,000 lb, they turn any equipment into a real milling machine, further enhancing the utility of their equipment. 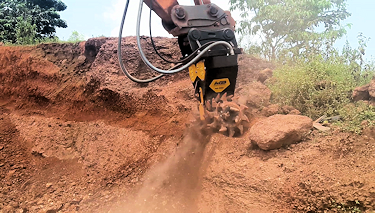 The MB-R Drum-cutter grinds particularly resistant and tough materials, such as fragmented rocks, but it can also work on soft materials, such as asphalt or wall profiling, performing with extreme accuracy. It simplifies excavation operations, especially where the subsoil is particularly resistant. It digs the trenches necessary for pipe laying and it restores the banks of rivers and streams with speed and precision. It can be used underwater. The biggest model, the MB-R900 fits excavators with operating weight from 42,000 lbs up to 77,000 lbs, it is particularly suitable for trenching, leveling and repairing road surfaces. It grants excellent results in surface profiling and tunnels excavations, allowing materials to be immediately re-used on site. The smallest model MB-R500, weighs only 660 lb. Its small size makes it ideal for applications in urban areas and confined construction sites, especially those that require precision. It works easily in city centers, where vibrations and noises must be contained. On all 4 available models, drums can be replaced on site by operators, in less than an hour, without the need of intervention of a specialized workshop. MB’s R drum-cutter range comes with a full or low set drum head kit, with different pick configuration sets, enabling pertinent adaptation based on the material to grind and work to be executed. Extremely compact and specifically designed with a low center of gravity to significantly improve the machine’s overall balance. The only one in the world with the patented system – direct drive twin motor – which distributes a selected force into the two drum heads. In case of materials with different hardness, MB-R drum cutters mold by using a proportional force depending on the material tenacity, increasing stability and reducing stress on the excavator arm.